A video showing the actual beheading of Barangay Captain Rodolfo Buligao by suspected Abu Sayyaf Group members is making the rounds online. The 2-minute, 17-second clip was uploaded Saturday on Facebook, four days after the village chief's decapitated body was found in Maimbung town in Sulu. 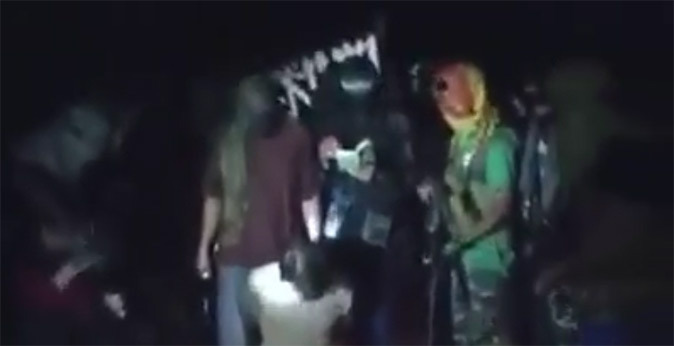 In the video, Buligao is seen being surrounded by a group of armed men wearing masks. One of them is heard as saying that the captive would be beheaded because the family and negotiators failed to pay ransom. As the bandit finishes the statement, another ASG member beheads the barangay official with a very sharp bolo. The video is currently spreading like wildfire. According to reports, Buligao's remains were already brought to Zamboanga City aboard a ship of the Philippine Navy and received by his daughter at the pier Thursday. The beheaded barangay captain was abducted by the rebel group last May 4 in Dapitan City along with two Philippine Coast Guard personnel, Seaman 1st Class (SM1) Allan Pagaling and SM2 Gringo Villaruz. In a video uploaded on June 23, the kidnappers threatened to behead one or all of the victims if their demands are not met.